Announcement ★ALL ITEMS ARE CURRENTLY SHIPPING WITHIN 1-3 BUSINESS DAYS!★ Welcome to my shop! Raven Ranch Studio is where I sell my handmade jewelry and gifts made with cast resin replicas of bird skulls and other small animal skulls. I make molds of real animal skulls, resin cast them, and then sand and finish the resin cast before turning them into jewelry, key-chains, magnets, wearable art, decor, and more. 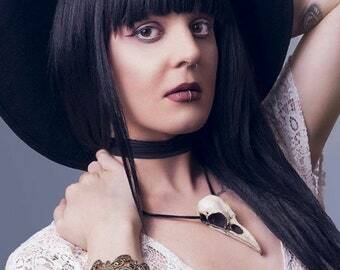 I also create a variety of other items including cameo necklaces, rock paper scissors necklaces, and handmade curiosities for those interested in skeletons and skulls, gothic fashion, fantasy jewelry, biker jewelry and Halloween costume accessories. ★ALL ITEMS ARE CURRENTLY SHIPPING WITHIN 1-3 BUSINESS DAYS!★ Welcome to my shop! Raven Ranch Studio is where I sell my handmade jewelry and gifts made with cast resin replicas of bird skulls and other small animal skulls. I make molds of real animal skulls, resin cast them, and then sand and finish the resin cast before turning them into jewelry, key-chains, magnets, wearable art, decor, and more. I bought these as gift for my friends! I guess they love this absolutely!! Thank you so much for this cool stuff!! I’m Ada…owner of Raven Ranch Studio, self-taught jewelry designer and resin artist. I get a lot of my inspiration from nature and am especially fond of ravens and hummingbirds and incorporate them into my art often. You can be assured that the animal bones I cast from are collected ethically and responsibly. The majority of the resin replicas I create have been cast from borrowed specimens from a local wildlife foundation here in Minnesota. I also cast replicas from birds and small animals who have had unfortunate accidents with windows or cars. By casting replicas of these amazing creatures I feel as if I am giving them a second life and honoring their beauty. I have an eye for fine detail and can be a huge perfectionist in my craft, so you can be assured you will always be getting high quality work from me. I am fully committed to Raven Ranch Studio and I stand behind every single one of my designs. I meticulously create my jewelry to not only look amazing, but to be extremely durable and reliable. My main goal is to design fascinating, high-quality, unique and one-of-a-kind pieces that will quickly become your favorite accessory to proudly show off for all to see! Like me on Facebook to keep up with my new creations and to be the first to know about special promotions, contests, and coupon codes! Hello and welcome to my shop! My name is Ada, I am a resin and jewelry artist from Minnesota. I appreciate all things unusual and uniquely beautiful. I specialize in making cast resin replicas of bird and small animal skulls. Hello and thank you for visiting Raven Ranch! Please send a note with any questions, or if you would like to inquire about a custom order.